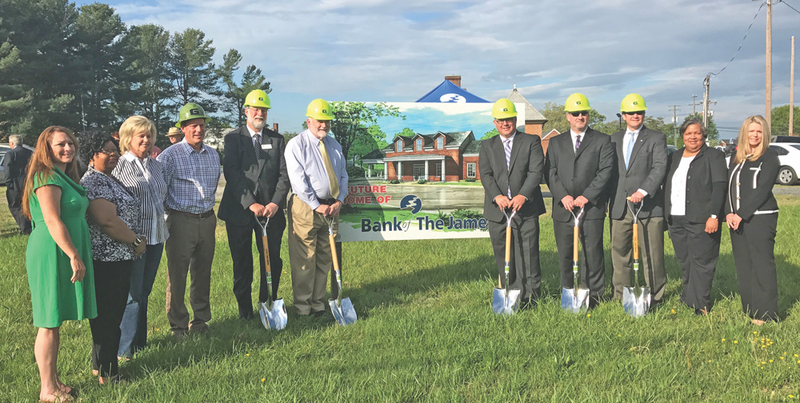 Construction is now underway on a permanent Bank of the James facility in Appomattox. Located on Confederate Boulevard, the new 2,100-square-foot building will have four offices, two drive thru lanes, an ATM and a night deposit. The building’s design will be similar to the style of the Appomattox Courthouse. The bank opened a temporary mobile facility on Old Courthouse Road in October 2016. Since then, Bank President Robert R. Chapman III says they have been honored by the positive reception from the community. “As a community bank, Bank of the James combines cutting-edge capabilities, technology and knowledge with an understanding of the communities in which we live and the people we serve. It is good to be in Appomattox,” said Chapman. Thomas R. Cobb, a native of Appomattox, is the bank’s Vice President and Regional Manager. Angela M. Williams serves as Assistant Vice President and Branch Manager and Wanda F. Evans is the bank’s Financial Services Representative. In a move that continues to expand its reach across the state, JES Foundation Repair has opened a new office and warehouse in Salem. The 4,000-square-foot space is located on Southside Drive and includes service and installation staff. The privately-owned family business has been operating in Virginia since 1993 and specializes in residential and commercial foundation repair, crawl space encapsulation, basement waterproofing and concrete leveling. JES merged with Evergreen Basement Systems, another family-owned basement waterproofing company, last year. Following two decades of promoting downtown Lynchburg, the former Lynch’s Landing Foundation has officially relaunched as the Downtown Lynchburg Association. The Lynchburg City tourism department is merging with the Lynchburg Office of Economic Development, putting both departments under one umbrella. This news comes as Sergei Troubetzkoy announced his retirement in early April. Troubetzkoy became Lynchburg’s tourism director in 2014 after spending seven years as the director of tourism in Bedford County. Read more about these tourism developments starting on page 23. The City of Lynchburg received a 2017 Community Economic Development Award (CEDA) from the Virginia Economic Developers Association (VEDA) for Lynchburg Innovation Week. The three-day event was held June 2-4, 2016 at Riverviews Artspace and featured a wide range of learning and networking opportunities to enhance and celebrate new strategies for economic development. Hosted by the Lynchburg Economic Development Authority, Lynchburg Innovation Week was organized by Cities Reimagined, which develops innovative economic development strategies and programming. “Ultimately, the intangibles were what probably mattered most. Meeting other small business owners and creating a little network of people tackling similar challenges,” said Randy Smith, CO.STARTERS graduate and Community Business Launch recipient of funding for The Craft Crucible, a craft woodworking space. The CEDA awards were presented at the VEDA spring conference in Charlottesville. They are designed to recognize outstanding communities in the Commonwealth for their efforts in advancing the economic viability of their community through economic and community development programs. The Lynchburg Regional Business Alliance has once again earned the highest distinction possible from the U.S. Chamber of Commerce, the 5-star accreditation. Of the 7,000 chambers of commerce in America, only 195 are accredited. With its 5-star ranking, the Alliance is in the top one percent of all chambers of commerce in the U.S. The Alliance first earned basic accreditation in 1973. But recently, the Alliance has been at the top of the heap, earning 5-star accreditation in 2006, 2011, and again in 2016. “To receive a 5-star accreditation demonstrates our effective staff, strong working relationships and partnerships that create a positive impact for the Region. The result of our hard work is evidenced by this impressive rating. But, in truth, we should all be extraordinarily proud of this milestone achievement. It was a true team effort,” said Alliance CEO Megan Lucas. A chamber must apply to the U.S. Chamber every five years to maintain accredited status and must demonstrate competency in nine core areas and meet specific standards in its operations and programs, including areas of governance, government affairs, technology, planning and finance. A marketing firm took top honors at the Lynchburg Regional Business Alliance’s 2017 Small Business Awards. The overall “2017 Small Business of the Year” award was presented to 434 Marketing, a marketing firm that partners with organizations to advance their communication plan to support the marketing process from research, to strategy, to execution, to analysis. “According to the Wells Fargo/Gallup Small Business Index, small business owners are the most optimistic than they have been since July 2007. So now is a great time to take this opportunity to celebrate our region’s small business successes!” said Luke Towles, Market-President of Wells Fargo and Chairman of the Alliance’s Small Business Committee. Over 80 percent of the Alliance’s membership is comprised of small businesses. A Lynchburg family has a new roof, thanks to Lynchburg Roofing’s “No Roof Left Behind” contest. Thousands of people cast votes, but in the end, John and Pam Jarman were the winners. They have four children; their youngest son, Hunter, is a student at Heritage High School. He has many medical challenges including severe scoliosis, Ehlers Danlos Syndrome, Ocular Albinism and Mitral Valve Prolapse. Brenda Meeks, a staff member at Heritage High School who sees Hunter daily, nominated the Jarman family for the contest. Hunter has been through over 20 surgeries and soon will be going through another major surgery at Shriners Children’s Hospital in South Carolina. “He’s such a trooper,” said his mom, Pam Jarman. “No Roof Left Behind” is a program sponsored by Lynchburg Roofing and GAF to give the community a way to help their good neighbors that have fallen on hard times. This is Lynchburg Roofing’s fourth year participating in the program. Horizon Behavioral Health has opened a new recovery residence that will enhance the continuum of care for substance use disorders in Central Virginia. In response to the statewide effort to address the opioid epidemic, Horizon opened its Recovery Residence in Lynchburg on May 1. This licensed residential treatment facility is for women with co-occurring disorders of mental illness and substance use. With six beds, the residence will provide stable housing and continued treatment for consumers referred from other providers or community service boards throughout the Commonwealth or discharged from Horizon’s medically supervised detoxification program. While women stay in this home, they will have 24/7 support in a structured but relaxed environment. They will learn life skills, volunteer in the community, and take guided steps toward full independence. They will also be provided with transportation to and from treatment at a Horizon Behavioral Health Wellness Center.